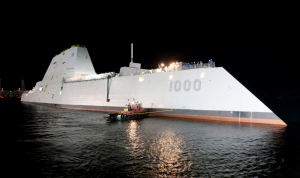 The US Navy’s DDG 1000 Zumwalt-class destroyer is a new $4 bilion beast of a vessel, featuring some insane bells and whistles. In fact, the futuristic warship comes equipped with two guns capable of striking targets from an astounding 80 miles away. However, while the ship’s two Long Range Land-Attack Projectile (LRLAP) guns manufactured by Lockheed Martin work perfectly well, it seems the Navy wasn’t prepared for just how much rounds for the guns cost. Astonishingly, rounds for the guns cost over $800,000 each, a result of the Navy cutting its initial order of 28 warships to merely three. At the moment, the Navy has not only suggested potentially cancelling the LRLAP guns, but is also looking for replacements which could come from Raytheon or BAE Systems. It is worth noting that some rounds have already been purchased and will be utilized during the Combat Systems Ship Qualifications Trials in 2018.